And what is this celebratory thing to the progressive mind? It is the progressive income tax. This year it turns 100. Its permanent establishment was set forth in two historic moments: 1) an amendment to the Constitution (the 16th Amendment), ratified February 3, 1913; and 2) its signing into law by the progressive’s progressive, President Woodrow Wilson, October 3, 1913. It was a major political victory for Wilson and fellow progressives then and still today. By my math, that ought to mean a long, sustained party by today’s progressives, a period of extended thanksgiving. President Obama once charged that “tax cuts for the wealthy” are the Republicans’ “Holy Grail.” Tax cuts form “their central economic doctrine.” Well, the federal income tax is the Democrats’ Holy Grail. For progressives/liberals, it forms their central economic doctrine. What Dean said is, in a few lines, a cornerstone of the modern progressive manifesto. For Dean and President Obama and allies, a federal income tax based on graduated or progressive rates embodies and enables government’s primary “job” and “purpose.” They embrace a progressive tax for the chief intention of wealth redistribution, which, in turn, allows for income leveling, income “equality,” and for government to do the myriad things that progressives ever-increasingly want government to do. And so, in 1913, progressives struck gold. 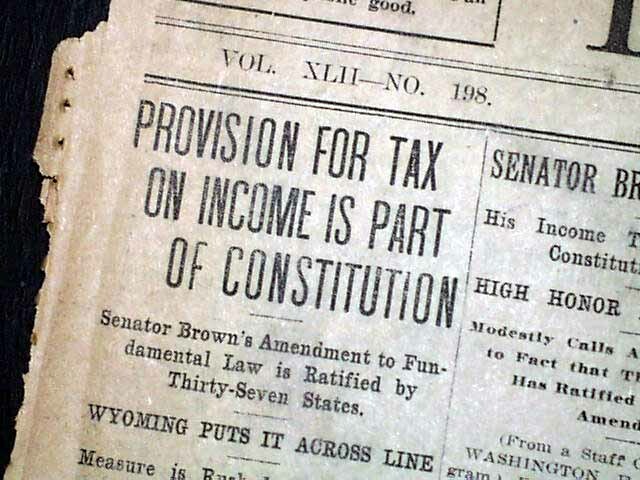 The notion of taxing income wasn’t entirely new. Such taxes existed before, albeit temporarily, at very small levels, and for national emergencies like war. The idea of a permanent tax for permanent income redistribution broke new ground. The only debate was the exact percentage of the tax. In no time, progressives learned they could never get enough. Disagreeing with Wilson were the Republication administrations of Warren Harding and Calvin Coolidge, his immediate successors. Along with their Treasury secretary, Andrew Mellon, they reduced the upper rate, eventually bringing it down to 25 percent by 1925. In response, the total revenue to the federal Treasury increased significantly, from $700 million to $1 billion, and the budget was repeatedly in surplus. Unfortunately, the rate began increasing under Herbert Hoover, who jacked the top rate to 63 percent. It soon skyrocketed to 94 percent under another legendary progressive, FDR, who, amazingly, once considered a top rate of 99.5 percent on income above $100,000 (yes, you read that right). The upper rate increased again (to 31 percent) under George H.W. Bush and under Bill Clinton (39.6 percent). George W. Bush cut it to 35 percent. Barack Obama has returned it to the Clinton level of 39.6 percent. Here in 2013, 100 years henceforth, the wealthiest Americans—the top 10 percent of which already pay over 70 percent of federal tax revenue—will be paying more in taxes this year than any time in the last 30 years. For progressives, this is justice. But it is also bittersweet: As progressives know deep inside, it still isn’t enough. For them, it’s never enough. To that end, my enduring question for progressives is one they typically avoid answering, especially those holding elected office: In your perfect world, where, exactly, would you position the top rate? I routinely hear numbers in the 50-70 percent-plus range. Democrats like President Obama complain about Republican “intransigence” in raising tax rates but, truth be told—and as any liberal really knows—if it wasn’t for Republican resistance, progressives would rarely, if ever, cut taxes. America would remain on a one-way upward trajectory in tax rates, just like under Woodrow Wilson and FDR, and just as it has been in its unrestrained spending for nearly 50 years. Like their refusal to cut spending (other than on defense), progressives are dragged kicking and screaming into tax cuts. They need high income taxes for the government planning and redistributing they want to do; for Obama’s sense of redistributive justice. This year, the progressive income tax turns 100. For progressives, getting it implemented was a huge triumph. Their success in making it a permanent part of the American landscape is a more stunning achievement still.